Top : The view of House of Toilet and the village of island on a slope in the morning. It is located at the point where the tourists take the breath after going up a steep hill. The concrete building on the back is a distributing reservoir which adjusts the water pressure of water service and is scheduled to pull down after the completion of the new water tank. The exterior appearance is finished with Fiber Reinforced Plastic Waterpfooring. In the traditional local house in Ibukijima Island, the toilet is mostly established in a small cottage separated from the main house. In Ibukijima Island, the toilet is a peripheral space that is repelled and excluded from the main house. 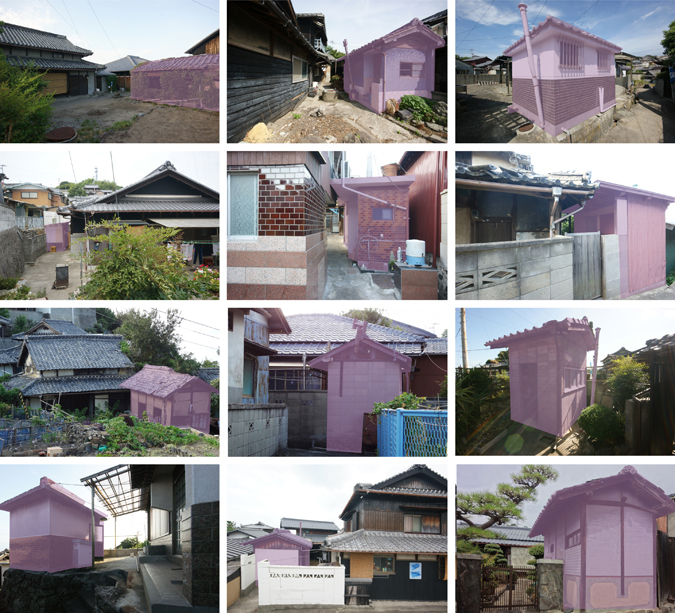 House of Toilet tends to change the peripheral space into the center of Ibukijima Island and to give intensity to Ibukijima Island that has been used as the periphery. Bottom : The examples of the toilet in Ibukijima Island.